Ifa Bayeza is an award-winning playwright, producer, and conceptual theater artist. Her works for the stage include Amistad Voices, Club Harlem, Kid Zero, Homer G & the Rhapsodies, and The Ballad of Emmett Till, winner of the 2008 Edgar Award for Best Play and a 2007 Eugene O'Neill Playwrights Conference fellowship. 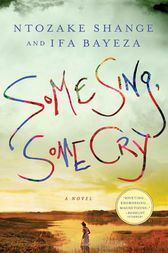 A graduate of Harvard University, Bayeza is a board member of the SonEdna Literary Foundation. She lives in Chicago.